When I designed the first hinged ankle brace 30 years ago it was a real challenge garnering support for this innovative new technology and promoting product sales as a result. ROM and proper joint support seemed counter-intuitive to many, with the prevailing thinking being that they were somehow mutually exclusive. Restricting normal joint ROM was thought to be the best way to provide support to the joint, while this new technology actually allowed for unrestricted ROM. Of course, we now know that real performance actually hinges on being able to provide both ROM and support. When I talk about an ankle brace allowing full unrestricted joint ROM, I’m talking about normal plantar and dorsiflexion ROM, not excessive inversion, eversion or rotation ROM that causes injury. Of course we want to restrict these types of excessive motion, but how best to do that? What we discovered was, with bracing – especially bracing for athletes – it’s not about the support afforded when the brace is first put on, it’s about the support provided 45 minutes into a game when a basketball player, for instance, comes down with a rebound and lands on another player’s foot. In other words, how can an ankle brace provide long lasting ankle support throughout practice or an entire game? For an ankle brace to provide long lasting ankle support, the brace must stay securely in place over a long period of time. The straps must stay secure and maintain their tightness. The brace must maintain its proper positioning around the joint. In short, the ankle brace must move with the joint, not against it. When the brace moves with the joint the straps stay tight and securely in place keeping the brace in the proper alignment. 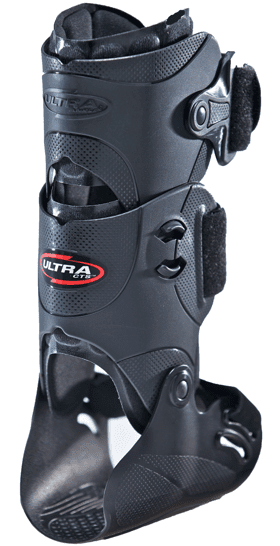 It’s when a brace works against normal ROM that the straps stretch, migrate and shift causing rapid loss of support. Can you think of an ankle brace that works against normal ROM? The century old lace-up corset style ankle brace quickly comes to mind. It’s inherent, restrictive design works against normal ankle ROM, actually resulting in a rapid loss of support over time. As an athletic trainer friend of mine says, “Lace-ups are a dirty sock in twenty minutes.” And he’s right. 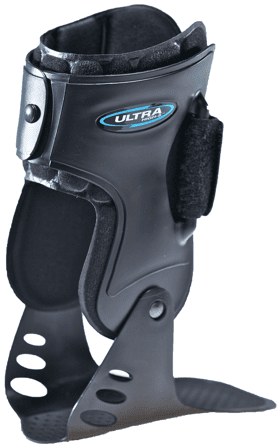 Knee braces are, in fact, designed upon this same principle, with the lace-up knee brace also losing support over time versus more structural hinged braces. Many ATC’s are too young to remember, but lace-up knee braces were the standard technology in the early 1970’s, until the first hinged knee brace was developed. After that, lace-up knee braces disappeared, more functional hinged knee bracing technology made them obsolete. This same evolution is taking place with ankle bracing, as sports medical professionals are experiencing that an ankle brace that moves with the joint, and not against it, will stay securely in place, maintaining long-term support.